A good kick can be the difference between defeat and glory. Make sure you have a proper kicking tee to help ensure that you do not miss the mark because of your equipment. 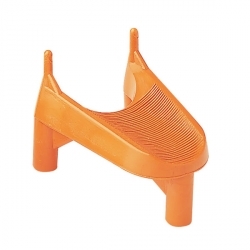 The Champion Sports 2" Kick-Off Tee is made of heavy-duty orange rubber, and has ridges to keep the ball in place.